Where is Scare Farm Located? Is Scare Farm outside/will I get dirty? Yes, the Scare Farm haunted attractions are outside and you could get dirty. You may have to crawl or crouch down to fit through some areas. This is a farm and some attractions are in field areas with real dirt. Are there restrooms at Scare Farm? Yes there are port-a-john’s available. Where can I park and is there a charge? Parking is free and located right next to our ticket booth in an open field. What should I wear when I visit Scare Farm? You are coming to a farm, so don't wear your best shoes or brand new clothes! And dress according to the temperature, it can be windy and colder than you think. What can my senses expect while at Scare Farm? Do you sell food and beverages at Scare Farm? Yes. We have a concession stand that sells hot dogs, hamburgers, cold and hot drinks and more. NO! Smoking is not allowed! We are a farm and there are many flammable objects. Any violators of this policy will be ejected from the premises without a refund. Is there Security at Scare Farm? Yes, Uniformed Police Officers, Security Staff and plain clothed Security Personnel. Scare Farm has a ZERO Tolerance policy for trouble makers or unruly guests. These people will be ejected from the premises without a refund. We want everyone to have a safe and fun experience at Scare Farm. Are the haunted attractions the same as last year? Absolutely NOT!! Scare Farm is all new. We will still have two walking haunted trails, Creepy Hollow and Paranoia that have many new and exciting scares, plus we have added The Slay Ride – our new Haunted Hayride, it’s sure to challenge your senses. Is Scare Farm a ride or a walk? Visitors will walk through Creepy Hollow and Paranoia. The Slay Ride is a hayride. Has anyone ever p****d their pants? Yes, pants wetting can and has occurred. Usually more than once a night! Can I go in if I'm pregnant or have a health condition? Scare Farm Haunted Attraction are not recommended for visitors who are pregnant, have heart conditions or are in general poor health. Is Scare Farm wheelchair accessible? We can help wheelchair assisted people onto the hayride, but the walking trails are not recommended as they could contain mud. Are there any age restrictions and what is the appropriate age for kids? Scare Farm is recommended for adults and teens, but younger kids may come if parents choose to bring them. Parents need to be the judge of their own kids and how they handle scary things. A ten year old may have a blast, but a 40 year old may end up crying. Our recommendation is not for children under 13 years of age and we will not allow any children under the age of 13 to enter without an adult. Carrying babies though is NOT permitted. There are no special prices for children and there will be no refunds. Sorry, but there will be no refunds. You have purchased a ticket for the Scare Farm haunted attractions. You’ve paid to be scared. So, if you or your child is so scared that you can’t continue through the haunts, then we have done our job. There would be no reason for a refund. Are Scare Farm haunted attractions dark? There are very dark and low light areas in all the attractions. Is it a maze? Can I get lost? NO, the Creepy Hollow & Paranoia attractions are walking trails and you will not get lost. Can my friends and I wear our Halloween costumes when we come to Scare Farm? No. For safety reasons, we are sorry to say that all patrons are not permitted to wear costumes. Is Scare Farm open if it's raining? This is at our management team’s discretion, our patrons safety is our main concern. The best way to find out if we are open or closed is check the Website, Facebook or Twitter. You may also call us to find out if we are closed. If we are open on misty, drizzly nights, one or both of the walking trails may be closed, but the hayride may be open. However, the Farm is not under a big umbrella, so it will be wet. Are the Scare Farm monsters allowed to touch you? The actors at Scare Farm will not intentionally touch you. However, they do get very, very close and trying to get the best scare may unintentionally touch you. Occasionally you may brush up against their costumes or props. You may also come into contact with some of the sets. What can't we bring with us inside the Scare Farm haunted attractions? No pets! No weapons! No alcoholic beverages! No cameras! No smoking! No laser pointers or flashlights! No food or beverages! Can we be thrown out of Scare Farm for any reason? Yes. We do not allow foul language, pushing, vulgar behavior, weapons of any kind, alcohol, etc. We have a list of rules just like anyone else that must be adhered to for your own safety. Violation of these rules will usually bring a warning and then you will be asked to leave without a refund and may be prosecuted. Can we take flash photos the Scare Farm haunted attractions? NO photography of any sort is not allowed in the attractions. Haunted attractions are dark and people's eyes (especially the actors) adjust to the low light. When you flash your camera you're not only ruining other customers' experience but you're hurting the actors' eyes. Also, the fog used inside the attractions ruins flash photography. Although no photography or videotaping is allowed inside (including nightshot), the monsters working outside will quite often pose for pictures. 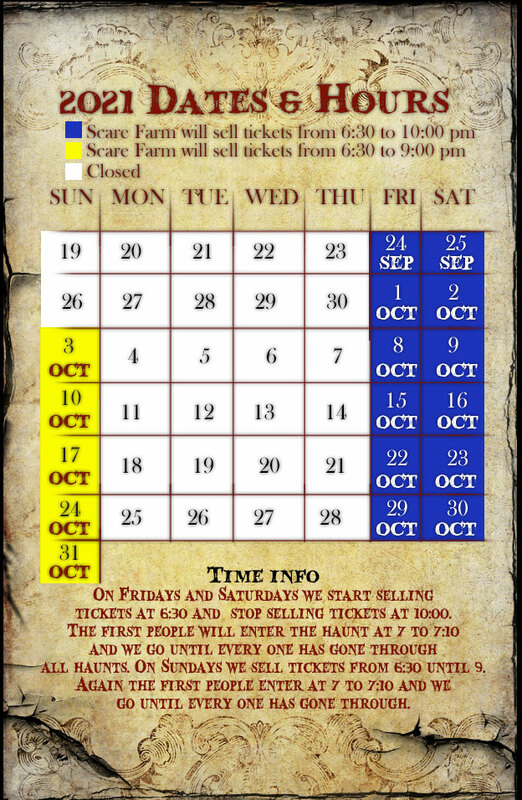 What are the prices for the different haunted attractions at Scare Farm? Please see our tickets page. Does Scare Farm accept credit cards? Yes, our ticket booth, concession stand and farm stand accept Visa, MasterCard, and Discover. We do not accept American Express. No. The Scare Farm attractions are first come, first served. No, we do not offer advance ticket sales. Does Scare Farm Offer Group Rates? Once we've used our ticket can we go through again with the same ticket? No. Tickets will be collected at the entrance to each of the attractions. A New ticket is required for each visit. Will be able to see all the attractions after the ticket booth closes? We keep the attractions running until the last patron has exited. We’ll stop selling tickets, but the attractions will keep running. When are the lines the shortest? On September dates, and on Sunday nights. Ticket sales start at 6:30pm. A bit before or as close to 6:30pm is always better. But you MUST BE here by ticket booth closing times to guarantee your entrance to the attractions. Early in the season, arriving at opening time is fine, but as we get closer to Halloween the crowds get larger. Where Can I Find Scare Farm Coupons? Can we win free tickets? Occasionally, radio stations or sponsors may have free ticket giveaways. The demented and twisted minds of our Owners and the Scare Farm management team. If I want to do a story on Scare Farm, how do I? How old do you have to be to work at Scare Farm? You must be at least 16 years old to work at Scare Farm. And the #1 most often asked question… Is it scary??? ?